A central premise of US media coverage of the Israeli attack on Gaza - beyond the claim that Israel is justifiably "defending itself" - is that this is some endless conflict between two foreign entitles, and Americans can simply sit by helplessly and lament the tragedy of it all. The reality is precisely the opposite: Israeli aggression is possible only because of direct, affirmative, unstinting US diplomatic, financial and military support for Israel and everything it does. This self-flattering depiction of the US as uninvolved, neutral party is the worst media fiction since TV news personalities covered the Arab Spring by pretending that the US is and long has been on the side of the heroic democratic protesters, rather than the key force that spent decades propping up the tyrannies they were fighting. Literally each day since the latest attacks began, the Obama administration has expressed its unqualified support for Israel's behavior. Just two days before the latest Israeli air attacks began, Obama told Palestinian Prime Minister Mahmud Abbas "that his administration opposes a Palestinian bid for non-state membership of the UN". Both the US Senate and House have already passed resolutions unequivocally supporting Israel, thus earning the ultimate DC reward: the head-pat from Aipac, which "praised the extraordinary show of support by the Senate for Israel's struggle against terrorist attacks on its citizens". More bipartisan Congressional cheerleading is certain to come as the attacks continue, no matter how much more brutal they become. In reflexive defense of Israel, the US government thus once against put itself squarely at odds with key nations such as Turkey (whose prime minister accused Israel of being motivated by elections and demanded that Israel be "held to account" for mounting civilians deaths), Egypt (which denounced Israeli attacks as "aggression against humanity"), and Tunisia (which called on the world to "stop the blatant aggression" of Israel). By rather stark contrast, Obama continues to defend Israel's free hand in Gaza, causing commentators like Jeffrey Goldberg to gloat, not inaccurately: "Barack Obama hasn't turned against Israel. This is a big surprise to everyone who has not paid attention for the last four years" (indeed, there are few more compelling signs of how dumb and misleading US elections are than the fact that the only criticism of Obama on Israel heard over the last year in the two-party debate was the grievance that Obama evinces insufficient fealty - rather than excessive fealty - to the Israeli government). That the Netanyahu government knows that any attempt to condemn Israel at the UN would be instantly blocked by the US is a major factor enabling them to continue however they wish. And, of course, the bombs, planes and tanks they are using are subsidized, in substantial part, by the US taxpayer. If one wants to defend US support for Israel on the merits - on the ground that this escalating Israeli aggression against a helpless population is just and warranted - then one should do so. As I wrote on Thursday, it's very difficult to see how those who have cheered for Obama's foreign policy could do anything but cheer for Israeli militarism, as they are grounded in the same premises. But pretending that the US - and the Obama administration - bear no responsibility for what is taking place is sheer self-delusion, total fiction. It has long been the case that the central enabling fact in Israeli lawlessness and aggression is blind US support, and that continues, more than ever, to be the case under the presidency of the 2009 Nobel Peace Prize winner. The US is not some neutral, uninvolved party. Whatever side of this conflict you want to defend - or if you're one of those people who love to announce that you just wish the whole thing would go away - it's still necessary to take responsibility for the key role played by the American government and this administration in enabling everything that is taking place. Due to extensive travel the past few days, I've been subjected to far more television news coverage than is probably healthy, and it's just been staggering to see how tilted US media discourse is: Israeli officials and pro-Israel "experts" are endlessly paraded across the screen while Palestinian voices are exceedingly rare; the fact of the 45-year-old brutal occupation and ongoing Israeli dominion over Gaza is barely mentioned; meanwhile, every primitive rocket that falls harmlessly near Israeli soil is trumpeted with screaming headlines while the carnage and terror in Gaza is mentioned, if at all, as an afterthought. Two cartoons perfectly summarize this coverage: here and here. Disgusting: "We need to flatten entire neighborhoods in Gaza. Flatten all of Gaza",says Sharon's son; http://www.jpost.com/...­ speaking admiringly" of Hiroshima – "the Japanese weren’t surrendering fast enough, so they hit Nagasaki." 10,000 reservists were mobilised for the IDF for the " Boxing Day Massacre" (call it this!!!) and 75,000 have been called up in Israel for this offencive. The Palestinians and Israelis can succeed when they take courageous steps to move forward towards a healthy and sustainable future in which we all share. And the international community can never, any more, turn away. The Israelis cannot claim self-defence. It is invasion, using all means from all directions – from air, ground and sea. Israel's cabinet authorised the mobilisation of up to 75,000 reservists late last Friday, preparing the ground for a possible Gaza invasion. Rather than self-defence, it is escaping responsibility. By contrast, is it not the right of the occupied to fight and free themselves from occupation and the continuous invasion and humiliations? What allows evil to flourish is good people doing nothing. It's time for political leaders to be courageous. What are they going to say to their children when they watch other children killed. Where's an international system built on justice and human values? History repeats itself, it's said. But this time history has not been allowed to repeat itself, since there has been no let up in the suffering and killing of the Palestinians, which continues on a daily basis. And we tend to keep appointments – at the time of elections, there are invasions, Palestinian blood used to win political campaigns. But this action endangers the life and future not only of Palestinians but also of Israelis. For this act is suicidal as well as destructive. The ultimate enemies are ignorance, arrogance, fear and greed. And the real courage would be to implement the peace treaties and plans. 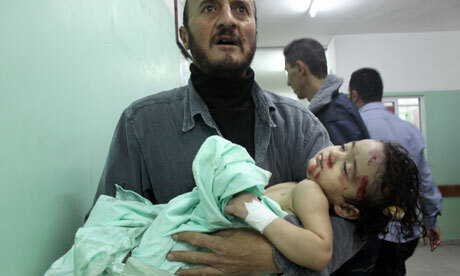 As I write, 39 Palestinians and three Israelis have been killed and more than 300 people severely wounded. The killed include eight children, three women, including one pregnant, and four elderly. Of the severely wounded there are 102 children. It is, again, a human tragedy. The political and military leadership – including all Israeli generals – know that military means will never put an end to this violence. We also know that occupations end and this one will eventually finish too. So, let's call a halt now to this craziness. Instead of using force against civilians, why not invest energy in moving forward in the peace treaties? The wound cannot heal while all the time there is a great commitment to deepening it and to add salt to it. 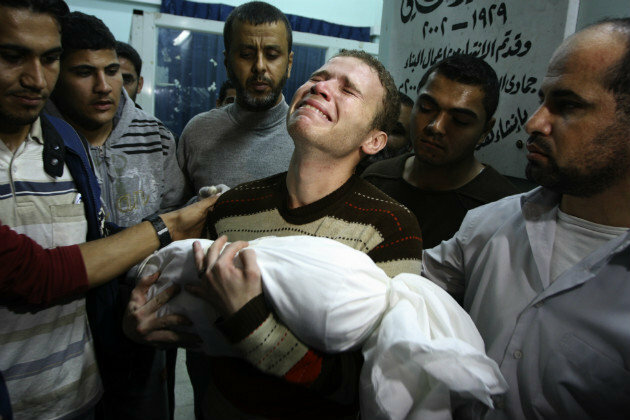 My family in Gaza are not safe; and the same can be said for all those innocent people in Israel. "No government would tolerate a situation where nearly a fifth of its people live under a constant barrage of rockets and missile fire," argues the prime minister, Benjamin Netanyahu, who faces an election in January. What about the Palestinian people who have suffered for decades? The military was ordered to conduct "surgical strikes" in Gaza, said Netanyahu, but Israel would take "whatever action is necessary to defend our people." There were also reports of rocket fire on Gaza overnight. It's news to me that Netanyahu is a surgeon. We do not know who taught him surgery and what kind of surgery he was taught. We, as doctors, practise constructive and curative surgery, not the destructive and traumatising sort. That is the kind of surgery he needs to learn and practise, a surgery that would heal and close the wounds of the Palestinians and the Israelis. What's more, who is showing any courage in this situation? In the midst of the escalation in violence, to be courageous would be to create, to build and construct; and to save lives. There's no courage in using power against innocent, unarmed civilians – or civilians armed just with their faith and their will to live independent lives. Nor is there courage – on either side – in manipulating the situation for limited political and individual interest. As for peace – to slip again into the language of a doctor – if a cell is suffering, the whole body will suffer and complain. It is the individual's peace of mind that leads to the peace of a community. It needs to become a way of life, a natural way of thinking – a huge task in a place where the opposite of endemic violence is routine. Hence the need to fundamentally change the context, and, on both sides, we need to be inclusive. The Palestinian people are in pain and anguish. We've had enough of hearing the mother cry of anguish, witnessing death. The woman who is screaming from labour pain waiting for the happy moment to have her newborn baby, that is the cry of the mother for life and freedom. The doctor's role is to help, to minimise the suffering and to deliver safely the children of the future. It's time for the international community to help and support Palestinians in this beautiful project. The world is plagued by violence and conflict. We need to move forward and emphasise the respect and dignity that each human being deserves regardless of gender or race. The freedom should not stop at Palestine borders, and we can endure through truth and justice. Peace will be a consequence of truth. Maria Montessori said: "Establishing lasting peace is the work of education; all politics can do is keep us out of war." Let us hope this is a turning point, and a way towards Palestinian freedom. We back brave anti Zionist Jewry, you should too..
"IF you had any real tears they would be for the Palestinian people!..." If you are disgusted by the slaughter; do something about it! "חמאס הוא עזה ועזה היא חמאס"
איבה רזק, עיתונאית-בלוגרית תושבת עזה, אמרה הערב בראיון לאילנה דיין, כי "כולנו כאן בעזה תומכים במעשי חמאס, כי בסופו של דבר ישראל לא מותירה לנו ברירה". עם זאת הוסיפה: "אנחנו מאמינים שהמצב משוגע, ושצריך להפסיק עם זה מייד"
Amongst the Best stories reveled; Cookie Roberts fake twitter "Applebee's Hmmm..."
Add this to your twitter, right now! The US has called for a "de-escalation" and support a ceasefire in the current conflict between Hamas and Israel. Yet, while calling for Hamas to cease its rocket fire on Israel, they have failed to clearly call on Israel to cease its artillery, naval and aerial strikes on the Gaza Strip. The undersigned, American residents of Egypt, are requesting a meeting with Secretary of State Hillary Clinton to explain to her the dangers of the US' current position. The conflict in Gaza has regional repercussions, and the United States should do its utmost to end the fighting and the mounting civilian death toll is has caused. This begins by making it clear to both parties that military acts must end. Americans in London; We've been running great events for the expat North American community for over 12 years now! This is a group where Canadians, Americans and those interested in North American Culture get together to meet new people, exchange experiences, and make lots of new friends. The group comprises of professionals, international students, long time residents and those that are new in town. There are always new people to meet and friendly familiar faces! We always meet in a new location within central London as a way of exploring this great city! Sign up to find out where we meet next! Special Note: Do Not Join this Meetup Group using Facebook. It allows Meetup.com to go into your facebook account. Or just click the blue button on the top right of this page which says "Join us!" "The truth shall set you free ......But first it will piss you off"